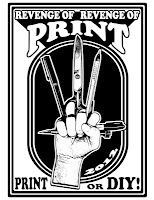 Last year, Atomic Books teamed up with Quimby's (Chicago), Reading Frenzy (Portland), Xerography Debt, and Zine World, Razorcake, Maximum Rocknroll and a number of other zine distros and libraries to issue a challenge: if you've ever made/currently make/plan to make a zine/comic/mini/book/publication - do one this year. We then set up the Revenge of Print Facebook group to help coordinate and organize and to use a resource. All of this was done out of finding the mainstream media meme "print is dead" rather tiresome. Now there are nearly 1,100 self-publishers in the group. And according to an informal tally by Quimby's and Atomic Books, nearly 2,000 titles came out in 2011 as a response to, in support of or in the spirit of "Revenge of Print." This year, Atomic Books has again teamed up with Quimby's, Reading Frenzy, Xerography Debt (and more TBA) to issue the challenge yet again. Print is only dead if you want it.